Icelandic Horse World Resort is located on the doorstep of the Canadian wilderness. Found in Okanagan wine country of British Columbia, our facility sits on over 300 private acres of spectacular and undulating countryside. Meals are served in a Gazebo with large sun deck and a hot tub. Enjoy the comfort of rustic log cabins equipped with electricity, bathroom w/shower, television, and internet. 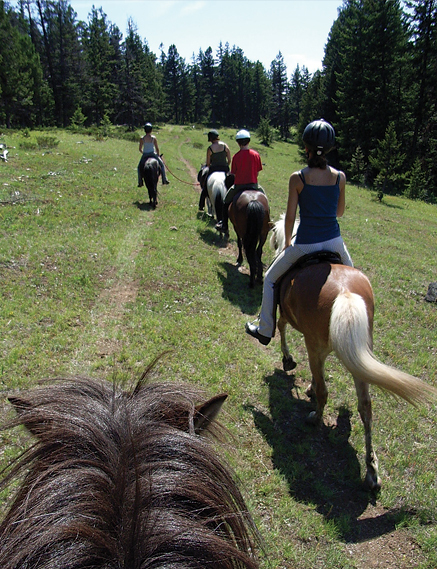 Riding instructions are given in the arena and then we set off on our wilderness adventure! Icelandic Horse World has over 50 years' experience with the Icelandic Horse, and have been offering riding tours since 2006.